Posted on the FRC Blog 4/15/19 by Frank Merrick. Check out the preparations for the big party! Folks here are already hard at work with setup. By the teams show up Wednesday, we’ll be ready for another world-class event! You can find the pit map for Houston here, including inspection stations, etc. If you are joining us in Houston to compete with your robot, once again this year, Inspectors will not be checking your robot bags and lock-up forms. Once you get to your pit and uncrate, just open your bag and start working, no need to wait for the OK. I can’t wait to get this show on the road! Woo Hoo! We’re all in the round robin! 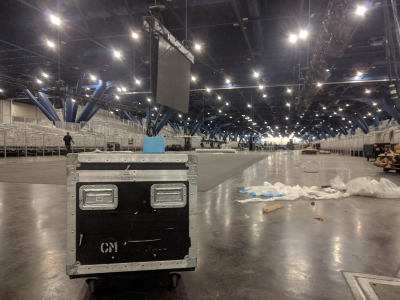 If you are joining us in Houston to compete with your robot, once again this year, Inspectors will not be checking your robot bags and lock-up forms. Why is this? Just not bothering with having to check every single team’s lock-up form? Yes! Just making it easy for teams to start working on their robot. Inspectors can better spend their ensuring robots are in compliance and ready to go for practice. Do we have to wait until 4pm to uncrate the robot? Or can we do that during load in? You can uncrate and start working as soon as you reach your pit. You can’t have more than 6 humans in the pits until 4 pm. They really want you to get your crate emptied and let the nice crate-wranglers take it away to crate-ville as soon as possible so that they can get that done while the number of humans in the space is more manageable. So…the Adult team member that stays with the vehicle won’t be in the pits, eh? or can park the vehicle then come in the pits? These are not the best instructions FIRST has ever written, and I am tired and making mistakes. I think, after re-reading the section that only the pit contents/tools and five humans (including one or more adults) can leave the dock and go inside the pits. The sixth human (definitely an adult) is probably expected to leave with the vehicle and not go to the pits until they open. Once you get to your pit and uncrate, just open your bag and start working, no need to wait for the OK. So long and thanks for all the individually numbered zip ties.